There are even times when any assumption of dignity becomes ludicrous, and the traveller must, as Mungo Park once had to do, ‘lay down as a rule to make himself as useless and as insignificant as possible, as the only means of recovering his liberty’. 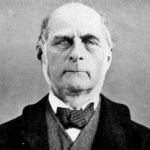 Sir Francis Galton was born in Birmingham, West Midlands, England. He was an English Victorian statistician, polymath, sociologist, anthropologist, explorer, eugenicist, geneticist, and inventor. He was knighted in 1909. He produced over 340 papers and books. His book Hereditary Genius was the first social scientific attempt to study genius and greatness. He wrote several books include: Natural Inheritance, Finger Prints, The Art of Travel, English men of science, and Memories of My Life.